Corporate Team-Building Workshops - Drumming Is Fun! 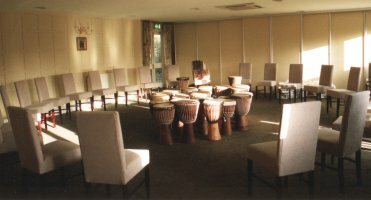 I work alone or with other facilitators (dependent on your needs) to give drumming workshops for businesses, staff training events, inset days and social functions. African Drumming sessions will quickly break down any barriers between management and staff or different departments. Playing together as a unified force energises people and provides new insights into group dynamics which carry through into daily working practices. Check out the benefits of what our inspiring teaching can bring to your team. We can motivate your conference delegates with newfound enthusiasm, and create positive experiences to cherish. Since session durations and group sizes can vary so much (from 5-150 people), please phone/email us with the full details we need to be able to give you an accurate quote. "Just what was needed to raise the energy levels at the end of a long day. Malcolm managed to involve the whole group (who had never drummed before) in playing complex sounding polyphonic rhythms. Everyone was very pleased with themselves for having created music on an instrument they had never played before!" "I just wanted to say a big thank you for yesterday, everyone really enjoyed the drumming and it was a real stress reliever!" "Feedback has been extremely positive. Everyone enjoyed it. We would certainly invite you back. It was professional and fun."